Now that I seem to be getting the hang of iOS development I want to try and get some cool integration with PaaS and BaaS services from various places on the internet. Perhaps some facebook integration, or perhaps building a slick iOS client for my blog that can do something beyond what a responsive client could do. I noticed that BestBuy has an open API – perhaps a connection to them querying on any products I review that are in their store? There’s not too much in the way of examples out there when you google around – and there’s not much in the sample iOS applications that Apple has. So what’s a developer with a week off form work supposed to do with this time? Relax? Yes! Exactly – so let’s grab some beers and maybe a decent whiskey (along with a few espresso’s) and dig in! RestKit.org – a great start! On iOS there do not seem to be too many libraries or frameworks that simplify working with REST/JSON interfaces, but there is one – restkit.org. I grabbed this kit and after reading thru the docs decided to give this one a shot. The docs were a little sparse – but after scratching my head and thinking “these install instructions can’t possibly work”, I gave it a shot. Holy smokes! They worked! Amazing! The best version to take a look at is the set of instructions on github – there’s a link to them from the main site. One disappointing thing is that none of the examples seem to work Correction: I’m not sure what was wrong, but they do in fact work for me – I’m using the very latest Xcode, iOS SDK, and OS-X (4.5.2, 6.0, 10.8.2). The examples all seem to start ok, but nothing ever loads up in the simulators. I performed a full clean and build – seemed to fix whatever was wrong. The next step is to build something useful – which means I need to find a decent service that I want to play around with. 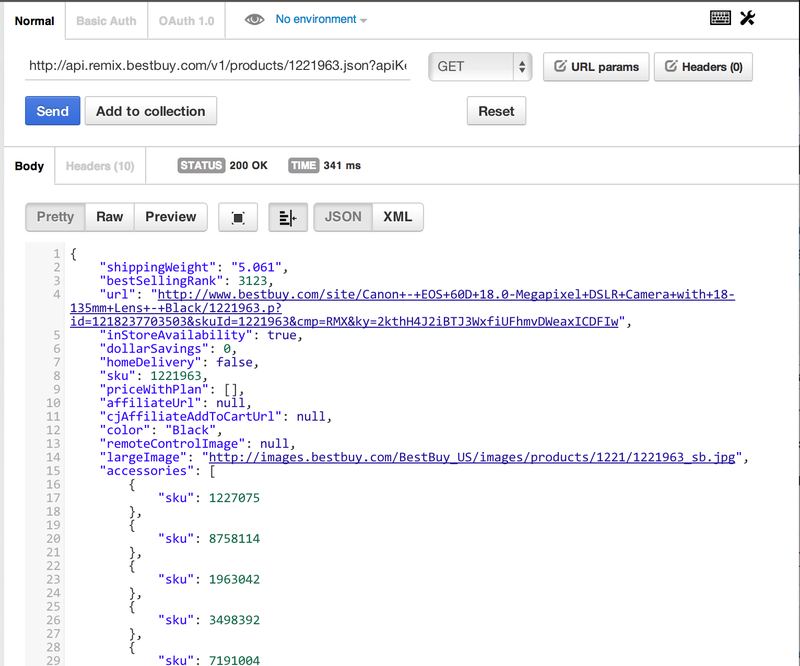 I learned the other day that BestBuy has an open API for querying their data – products, locations, reviews, etc. on the stuff they share. You can signup and use it for free at bbyopen.com. There’s some decent tools that can help you play around with REST and web APIs in general. Since I’m typing in Firefox, I’ll use Chrome to help out with this. Postman is a nice extension that can make REST/JSON calls pretty simple and save them to reuse them. Here’s a screen shot of a return from a query against the bbyopen service. Well that’s pretty nifty. You can get data in either XML or JSON formats. One thing I’m curious about – if API calls are throttled with the key then how do you keep your key from being hijacked since it is passed in the URL? You can extract out parameters like the host name and save those as environment variables so that switching from a test to a prod server is fairly simple. Once you get the hang of it, Postman is pretty handy. and you should be on your way. Seems toe work pretty darn good – great job to the folks at restkit.org! Now I’m going to explore getting a bit more serious with their object mappers and manager. 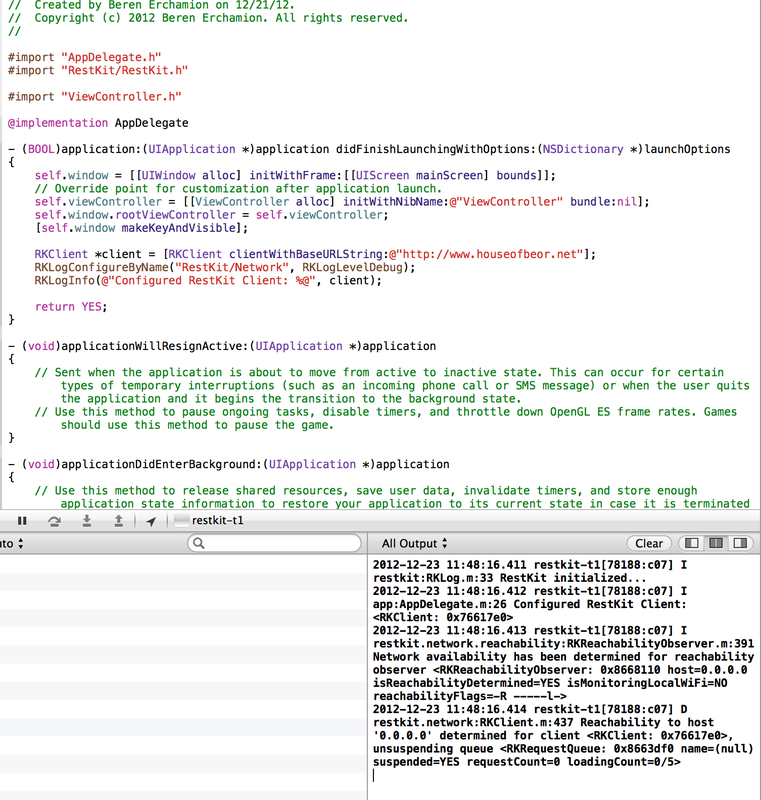 Previous story More Thoughts on Xcode…Getting the Hang of It – Updated 12/17/12!